No one wants to get a flu, and because it makes you feel so bad, two of the most common questions a person asks are: “how long does the flu last?” and “what treatment can I get to feel better?”. In this article I am going to answer these questions as well as describe the differences between cold and flu. You will also learn about cold and flu symptoms as this will allow you to distinguish between the two illnesses. The flu (also called influenza) is a very unpleasant and highly contagious condition which is caused by the influenza viruses. Influenza can range from mild cases which can last for a few days with only minor symptoms to very severe ones, which can be life-threatening. For most people, having the flu means spending a week or more in bed and having flu symptoms such as aching muscles, a sore throat, headaches, feeling very tired, and most likely having a fever. Generally, the flu usually appears in winter and early spring and it can affect anyone. Dr. David T. Derrer from WebMD says that the flu is caused by only 3 types of the influenza virus – A, B, or C.
The flu is highly contagious and spreads through whatever a person sneezes or coughs up. So, you can catch the flu from touching something that an infected person has touched and then touching your nose, eyes, or mouth. Or, you can get the flu by breathing in germs that are in the air. Flu symptoms usually appear within 1 to 4 days of the virus entering the body. Some people may have the flu virus and have no symptoms at all but still pass the virus to others. Because the flu can become a very serious illness which can last more than a few days, it is important to know the difference between the flu and the common cold. Colds are usually less severe than flu, and they usually last just a few days. An infection that lasts more than a few days can be the flu or a bacterial infection such as bronchitis, which can be treated with antibiotics as it’s not caused by a virus. Some of the regular flu symptoms are muscle and joint pain, fatigue, and you are likely to have a high fever (although it’s important to note that not everyone with flu will have a fever). Flu symptoms also come on very quickly and can last for more than a few days. Many people who become sick with the flu say it is like being hit by a truck. The American Lung Association suggests that for most people the flu lasts for a week but certain people are more susceptible to complications such as sinusitis, bronchitis, ear infection and pneumonia which can be life-threatening. Dr. Varnada Karriem-Norwood adds that most influenza symptoms gradually improve over two to five days, but it’s not uncommon to feel run down for a week or more. So the bottom line is that the duration of the flu is more than a few days and the recovery is gradual and can last for more than a week. But you need to look out for any flu complications as they can be life-threatening. It’s also good to know that a person with flu is contagious for up to seven days after the beginning of the illness, and a person can transmit the flu virus even one day before symptoms begin. Most people will recover from the flu by having plenty of bed rest and by staying hydrated. Serious cases of the flu can be relieved by medications and may even require medical supervision. There are some natural treatments for influenza that can help to relieve the symptoms and also shorten the duration of the flu. Before you go rushing to get some decongestants and anti-cough mixtures, it’s good to remember that most of the symptoms of flu are helping you recover. For example, fever can help kill off viruses in the body. If you want to learn more about the role of fever, and when it actually works for you, then please read my article on how to break a fever naturally. Also, coughing helps to loosen mucus and stop germs from going further into the body, and a stuffy nose helps to kill off the germs in your nose. I’ve already answered the question of how long the flu lasts but you’ll be pleased to know that elderberries can actually help you recover faster from influenza. Elderberries have been used for centuries to treat respiratory infections. There is evidence that elderberry extract can help treat influenza A and B viruses. If you want to make your own elderberry syrup to fight the flu virus, then you can check out this recipe: Flu Fighting Homemade Elderberry Syrup. Echinacea is another natural ingredient for influenza because it can help to boost the immune system.7 What’s more, it can also have a beneficial effect on upper respiratory tract infections.8 Although most of the studies into Echinacea have been on the root, you can make a great immune-boosting tea from the leaves, stems and flowers. To make the tea, boil a small pan of water and then let the Echinacea and ginger infuse for 15 minutes in a teapot. It is also recommended to keep the lid on so that the medicinal properties don’t escape. After 15 minutes, pour some tea into a cup and add honey or lemon to taste. If you want to know more about Echinacea, then please read my article about Echinacea tea benefits and how to use it for great health. Echinacea is a very versatile herb which is also used against many other infections, and is one of the herbs featured in my e-book the Herbal Remedies Guide. To use honey for flu you should always buy either raw honey or Manuka honey. You can add some to warm herbal tea (don’t add honey to hot water or tea because you will lose the medicinal properties from it) or you can take a teaspoon of honey and slowly swallow it. You may not know this but horseradish is an effective natural remedy to help get rid of a stuffy nose. It contains high levels of vitamin C and also mustard oil, which is antibacterial. A study by some German scientists found that horseradish root was just as effective as antibiotics in treating acute sinusitis and acute bronchitis – both side effects of the flu virus. The best way to take horseradish is by consuming it fresh. You can find my recipe on how to take horseradish to clear sinuses in my article on how to use horseradish for sinus infections, UTI, cold, flu and bronchitis. Steam vaporizer to help keep the air in your room warm and humid. You can also use certain essential oils in your diffuser. Steam inhalations. To hot water, you can add a few drops of essential oils like peppermint oil, tea tree oil, eucalyptus oil, or rosemary oil. Add spices to your meals. The best spices and ingredients to help clear congestion are garlic, ginger, chili peppers, and turmeric. Find more information in my article about the best home remedies for chest congestion. The Mayo Clinic says that one of the best ways to avoid getting the flu is to wash your hands regularly.10 Because the influenza virus enters the body via your eyes, nose, or mouth, you should avoid touching those areas with unwashed hands. Many people believe that hand sanitizers are the best option, but I’ve already written about the 6 hidden dangers of hand sanitizers. If you have to sneeze or cough, you should always cover your mouth. But don’t sneeze into your hands. Use a clean tissue or sneeze into the inner crook of your elbow. It’s also important to keep your immune system healthy. This is especially true if you have other chronic illnesses because you can be more prone to catching the flu. In this regard, you can read my article about 10 quick life hacks to improve your immunity almost immediately. Dr. Jennifer Robinson from WebMD recommends that one way to boost your immune system is to get enough rest. She suggests exercising and using relaxation techniques as well as getting enough sleep.11 In fact, a study published in the journal Psychosomatic Medicine says that stress increases the vulnerability to infectious diseases.12 (You can read more about it in my article on how stress affects your body). For more tips please read the article on natural ways to stay free from cold and flu. The flu can seriously affect children and the elderly. So they should be monitored closely if they have flu-like symptoms. 2. The difference between a cold and flu. 3. Vitamin C in Disease Prevention and Cure. 4. The effectiveness of vitamin C in preventing and relieving the symptoms of virus-induced respiratory infections. 5. Elderberry extract in the treatment of influenza A and B virus infections. 6. 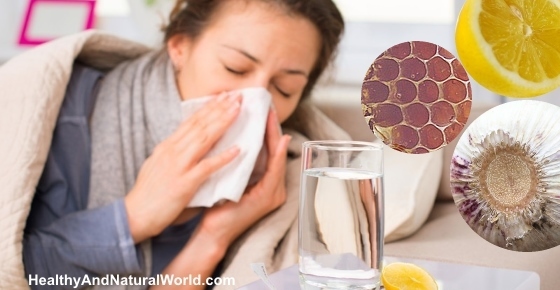 Is there a natural way to treat flu? 7. Immune enhancing effects of Echinacea purpurea root extract. 8. Use of Echinacea in upper respiratory tract infection. 9. Anti-influenza viral effects of honey. 11. Prevent the flu: boost your immune system. 12. Psychological stress and antibody response. 13. When to see a doctor for a cold or flu. So many different opinions regarding flu shots..Do you recommend getting one? Thanks. You have so much helpful articles. Hi Lee, this is a good question. Doctors I’ve talked to recommend getting flu shots. Some of my family members do get them. I’ve personally didn’t get one for many years and didn’t have a flu. However one year I decided to get one, and at the same year I got a very bad flu… It was, I assume, a different strain of flu. Since then I don’t get flu shots. I guess I just had a bad luck, but it had putt me off. It still doesn’t mean that you should not get one. I think there is a consensus among conventional medicine that you should get one, especially if you are at risk of flu complications (such as elderly people or people who suffer from chronic conditions) so the decision is yours.